In this workshop, we'll learn about traditional Ethiopian art and the Magic Scrolls that are worn there for protection, prosperity, and healing. 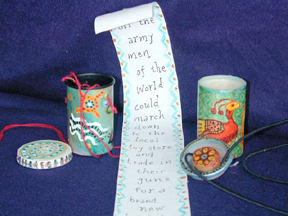 We'll make a personal scroll book from a long strip of paper, that rolls up and fits in a case you can wear around your neck. 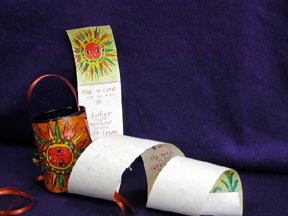 Make a wish for your family, your school, or a wish for the world, and decorate it with colorful designs and symbols. Then we'll make and decorate the case and you can keep your wishes close to your heart.